In accordance with the mission to keep people safe when working at heights, Safemaster was once again privileged to collaborate with Focus Building Company on the Lakelands Shopping Centre, to deliver a comprehensive height safety solution. As an ‘all under one roof’ height safety provider, Safemaster brought together their skills and ability to undertake the entire height safety scope, from initial consultation, design and in-house shop drawings through to manufacture, final installation and certification. To ensure continuous maintenance safety of roof assets at the Lakelands Shopping Centre, Safemaster has strategically designed and fitted fall protection and height safety access systems across trafficable work areas on the roof. One of the notable aspects of this project is the fittings of over 200 units of fall-arrest rated X-ERT surfacemount anchorages, and nearly 1.6 kilometres in length of SLIPNOT aluminium walkway including safety handrails. X-ERT anchorages and SLIPNOT walkway are both Safemaster founding products, and were specified due to their unique combination of aesthetics and functionality, whilst complying with Australian Standards AS/NZS. 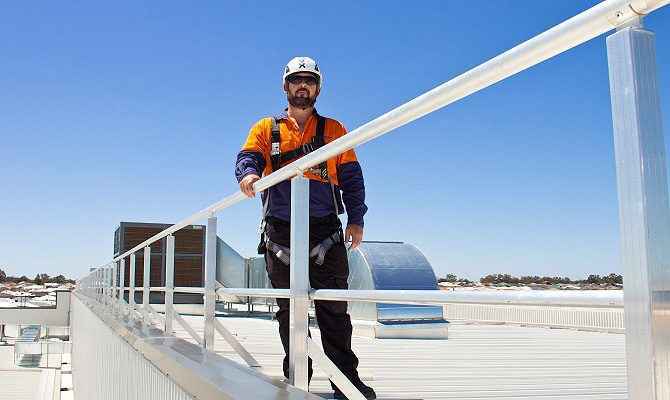 Falls from heights rate as the third highest incident for work-related fatalities in WA, and they are completely preventable. With the height safety systems in place at the Lakelands Shopping Centre, personnel are now able to work safely and with total confidence during ongoing maintenance tasks.